Our first Mid-Atlantic FSHD Family Day Conference will be held in the Baltimore, MD, area. Co-organized with Kathryn Wagner, MD PhD, and her team at the Kennedy-Krieger Institute, this meeting will update you on research ongoing at KKI as well as from other leading FSHD centers. Experts in genetics, physical and occupational therapy, orthotics, and mobility aids will also be on hand to answer your questions. Here is the preliminary agenda. Please register using the form below (click to open it). You can also request scholarships for free registration through this form. The deadline to register is September 25th. Questions? Contact June Kinoshita at june.kinoshita@fshsociety.org. Parking is available at the Nine East 33rd St. garage. 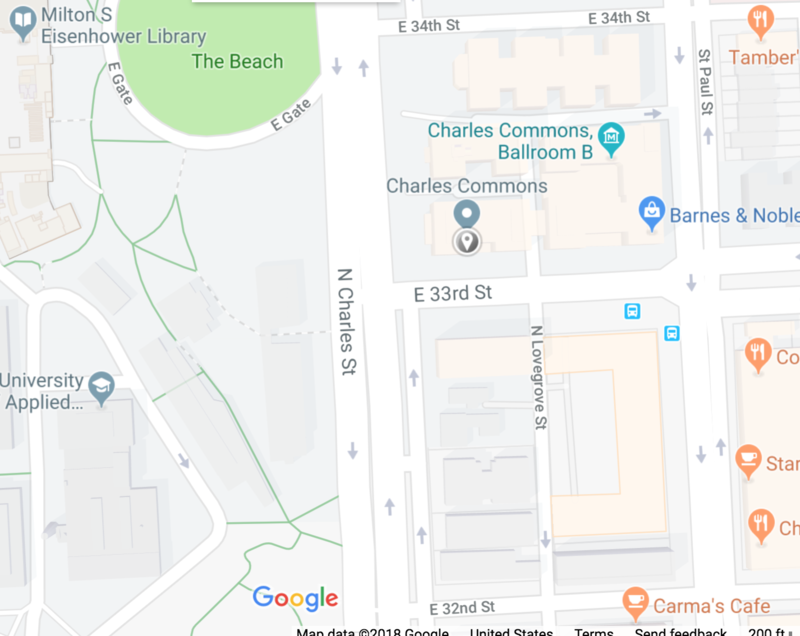 There are ample handicap spaces and an elevator from the garage to the lobby of the building across the street from Charles Commons. Enter Charles Commons via the E 33rd entrance (to Ballrooms). Driving and parking directions (pdf). Disclaimer: The FSH Society has rented facilities from the Johns Hopkins University. However, the Mid-Atlantic FSHD Family Day Conference and any programs operated by the FSH Society are not related to or affiliated with the Johns Hopkins University in any way. The FSH Society is an entirely separate legal entity with no connection to the Johns Hopkins University aside from the temporary use of facilities for the specified program.